When dealing with troubled teens, parents have significant rights to make decisions to protect their child and the safety of their family. When a troubled adolescent’s behaviors stem from mental health problems, parents also have rights to participate in their child’s treatment and seek multiple opinions about how best to manage the child’s symptoms and diagnosis. Parents of troubled teens have the legal right to enroll a child in the therapeutic setting of their choice, whether they choose outpatient counseling or intensive in-patient treatment. Generally, it is not necessary for the teen to consent to such services, although his therapist or treatment team will likely give him some input in development of his treatment plan. Likewise, parents can choose to put a troubled teen on psychotropic medications if a doctor or psychiatrist makes this recommendation, even if the teenager does not like this option. As a parent, you also generally have the right to learn about your child’s progress in therapy, including his diagnosis, explains Stephen Behnke and Elizabeth Warner of American Psychiatric Association's ethics department. However, in some situations, parents may not be entitled to all the details of the teen's treatment if the counselor determines that such a disclosure would be detrimental to the adolescent's therapeutic progress. 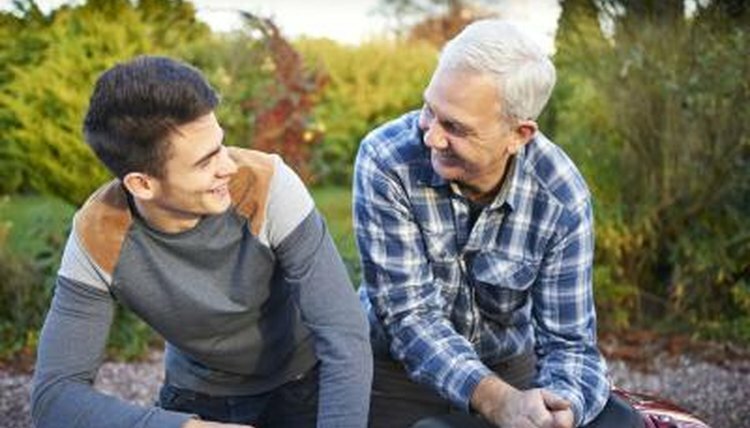 What Are My Legal Rights As a Parent With My 17 Year Old Son? In cases of severe behaviors that disrupt the family system or when a child poses a risk to himself or his family members, parents have the right to place the child in out-of-home treatment. In some jurisdictions, parents may need to go through the court system to facilitate in-patient psychiatric care, says the Empire State Coalition of Youth and Family Services. This might include therapeutic foster care, where the child lives temporarily with a family trained in severe behavioral issues. Generally, however, parents will need the recommendation of a therapist before having the teen removed from the home. In less severe cases, parents have the option of sending their child to a military school or specialized boarding school for troubled teens. Within your home, you have a legal right to set rules for your child, including curfews. You likewise have the right to punish your child for breaking rules, which in some jurisdictions can involve corporal punishment, provided that you do not injure, bruise or leave marks on your child, says Aspen Education Group, a therapeutic provider for teens with behavioral problems. However, laws on corporal punishment do vary from state to state. In your own home, you also have the right to search your child’s bedroom and remove property that you deem inappropriate or outside the boundaries of your rules, such as video games, movies, computers or phones. In most jurisdictions, parents do not have the right to terminate their parental rights to a teen because of his behaviors. You do, however, have the right to notify law enforcement if your child threatens or assaults you or any other person. You also have the right to notify law enforcement if you become aware that your child is involved in illegal activity. In addition, parents can notify the child's teachers of his behaviors. Indeed, this may be a good step in helping your child get the support he needs, advises the National Alliance on Mental Illness. Green, Anna. "Parental Rights with Troubled Teens." , https://legalbeagle.com/5562733-parental-rights-troubled-teens.html. Accessed 21 April 2019.